A high-speed nose bar transfer option, redesigned frame, additional belting and expanded guiding make Dorner’s newly redesigned 2200 Series low profile belt conveyors even better than before. What makes this redesign significant to customers is that Dorner took the “good” from its best-selling conveyor platform and made it better. This equals a conveyor platform that’s stronger, faster and more flexible for handling small to medium size part applications. The 2200 Series features a stronger, single piece frame design that reduces the overall number of needed stands. The frame comes with a Universal T-Slot that is compatible with industry standard hardware and makes attaching accessories and guiding fast and simple. Additionally, a 5/8” nose bar transfer option with V-Guided belt tracking safely transfers parts at speeds of up to 200 feet per minute for increased productivity. New tool-less fully adjustable guiding provides customers with added flexibility to further customize their conveyors to best fit their needs. Other improvements to the 2200 Series include new belting options and additional conveyor widths. 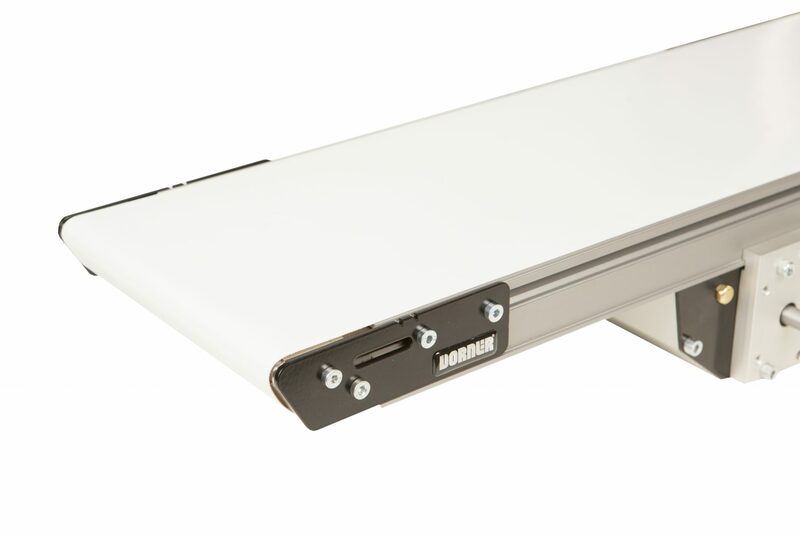 Dorner’s 2200 Series end drive conveyors can be equipped with the company’s recently released Universal Drive, which provides flexibility in design layout and simplifies spare part management with a single part number that covers all speeds, loads and mounting position. Dorner’s 2200 Series conveyors can be configured in Dorner’s Online Configurator, DTools. Users can engineer a complete conveyor and download a complete 3D CAD assembly model for instant validation of fit. Dorner builds its 2200 Series conveyors made to exact customer specifications and ship within three business days. Learn more about the 2200 Series Belted Conveyors. I hope you can help, I am looking for a small belt driven conveyor system that is circa 200mm wide x 1.5 metres long that can be programmed to stop under a measuring camera (which we already have) at a pitch of 150mm, dwell for 2 / 3 seconds then move on to the next component, the components are not heavy only grams in weight and are always flat. Is this the type of solution you sell?